I’ve been enjoying my XM radio immensely, the 80s and 90s channels are great, playing some really obscure records that I had long forgotten and even some Cliff Richard! There are occasional dropouts in the sound, presumably from the positioning of the antenna on the dashboard rather than on the roof, but they are few enough that they are not a major annoyance. Circuit City had left the installation of the SkyFi unit as I didn’t know where I wanted it or even how to do it. After some research I decided to go with installing it near the toggle switches using a Pro-fit Ultimount from xmfanstore.com. So far I like the positioning and there is enough leeway to tilt and turn it a fair bit. However I have lost the use of the cup holder beneath it and will have to see if I can move it to the other side or get a new one from somewhere. To get a closer look at the install, take a look at my handy skyfi install page. 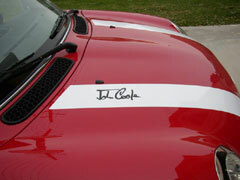 Then she got a pair of John Cooper signature decals but I think it looks better with just one of them on, perhaps I’ll keep the second as a spare in case this one comes off. She also got a couple of grille badges and a new console piece for under the toggle switches but we are going to send those back and get something else. There just doesn’t seem to be a good way to attach the badges on the Cooper S and the positioning of the XM radio is likely to make the console unusable. 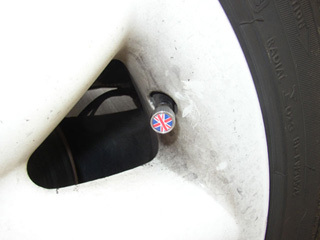 Also, coming from England is a belated gift from my parents, is a set of Union Jack mirror covers which will replace the white ones you can see currently. Sarah is proudly showing off her heritage! Well, it was my birthday weekend and Teri took me to San Diego where we ate, drank, and flew to San Luis Obispo for lunch (one very expensive hamburger). 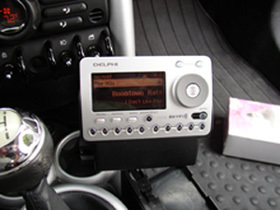 Also took the plunge and purchased a Delphi SkyFi XM Radio. Circuit City installed it in a couple of hours but we did not activate it before leaving San Diego. They installed the antenna inside the car and I am not sure that was such a good idea as there were occasional dropouts on the drive home. The XM radio website says the antenna should never be put inside the vehicle. I guess I shall see how it goes over the next week or so. I had them put the unit under the toggle switches as I have seen several pictures of that online, but it doesnt really fit like I thought so for now it is not stuck to anything until I do some more research. But I am looking forward to not having to listen to the boring local radio stations we get here. So today I did my first Zaino application and so far I’m not that impressed by the results. Its a lot of work: first I gave the MINI a wash in liquid Dawn to get rid of surface much; next, I used a claybar to get rid of surface contaminants; another wash this time in the Zaino car wash liquid; then a polish with their Z2 wax; another polish with their Z5 wax; finally another polish with the Z2. 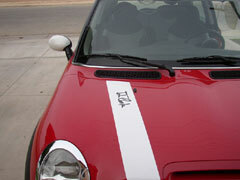 Is the result really that much better than spending $10 at the hand car wash in El Centro? Well, its dark now so its really hard to tell but sat here panting it sure seems like $10 is a bargain. Found a solution to the satellite radio problem. Some car kits come with an FM modulation device which broadcasts the satellite reception on an FM frequency, you can listen just by tuning in the MINI radio to the right channel. I would guess there is some small quality loss compared to the direct connection solution but I doubt my ears would be able to tell. I think I will pick something up after Christmas, and I’m thinking of subscribing to Sirius rather than XM.